Sunrise shell set with amazonite stone. 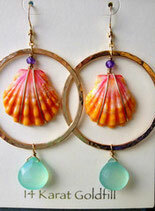 This rare and colorful scallop shell is a treasure to behold. 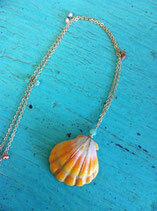 **Size and shape of shell may differ slightly. Noelani Studios with sunrise shells from the North Shore of Oahu. Hand-forged and hammered hoops with an a faceted amethyst at the top and chalcedony droplets are absolutely stunning! Sunrise shells may differ from the actual picture, as each shell is one of a kind and of nature's design. 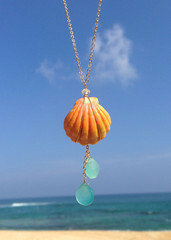 Sunrise shell uniquely set with sea green chalcedony drops. 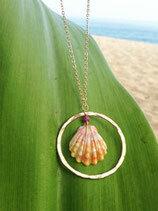 Sunrise shell uniquely set with red ruby and hammered hoop. 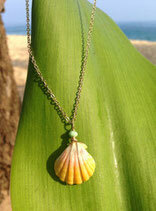 Exclusively found in Hawaii, this rare and colorful scallop shell is a treasure to behold. 18" 14K gold fill chain. Sunrise shell uniquely set with semi-precious chrysoprase. Chrysoprase enhances creative expression and relaxation. 16" 14K gold fill chain.